Woot! I had a blast at my first Computers and Writing (2013) this weekend! A quick shout-out to the organizing team led by Jill Morris and the hosting university, Frostburg State University, MD, for a job well done. My panel consisted of Matt Barton (my thesis director), Jack Hennes, and myself, and we presented Friday morning in the first session. We briefly introduced MOOCs to the audience and talked about the implications of MOOCs on teaching composition and higher education as a whole. The session was well attended by scholars who are interested in topic. My experience in the 4-day conference has been rewarding and beneficial to my thesis development. Cindy Selfe, Susan Delangrange, Risa, and Kristin Arola are among the scholars whom I have read in my rhetorical and composition theory classes and had the opportunity to discuss issues concerning massive online model of education with them at this conference. 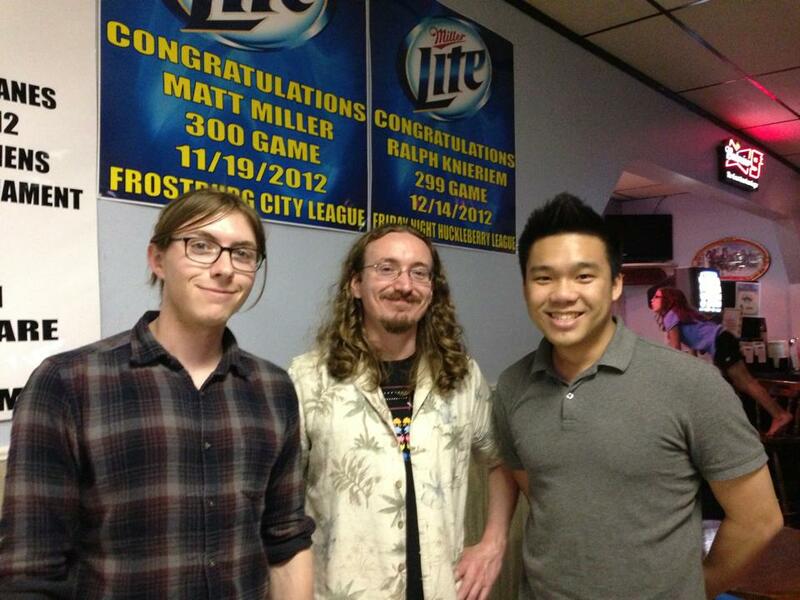 Jack, Matt, and I at the bowling social night. I must admit that I was a little star-struck when I shook their hands for the first time and introduced myself. But these folks were so welcoming that my fear disappeared almost instantly (for some, after a couple drinks with them). Michael Day, Janice Walker, Cheryl Ball, and many other graduate students (and recent grads) from the discipline are extremely friendly and personal. This conference has really opened my circle to the theorists and scholars in the field and those who I would like to study with in my PhD program. How I wish my Mass Communication program (my second master) would have conference like this to connect students with the most prominent thinkers in the field and prepare them for their doctoral pursuit. Maybe the CW community is simply unique. It’s indeed an honor to join their rank in the near future. For now, it’s time for some post-conference recovery, if you know what I mean. ← What about a MOOC ft. Dr. Sheldon Cooper?